Seriously: is the United States of America even a country anymore? Disgusting comment, but knowing Trump’s history of racist and outrageous statements, I cannot say I am surprised as nothing really surprises me with Trump. Still what is scary is how many Americans share his views. A minority yes, but a very sizeable one. The idea he is just politically incorrect is nonsense, Trump is a blatant racist plain and simple. If it were a true statement, yes. But it’s not. The White House sure made a strong effort to deny those comments today. Just returned from a meeting that included some from the United States. Over a drink, an American, unprompted, went into an impassioned defense of Trump. 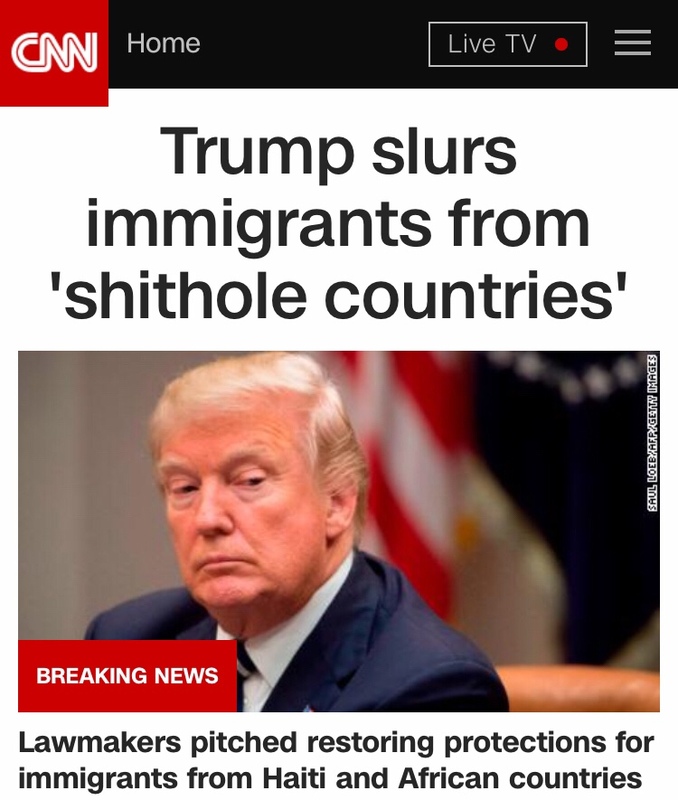 Sadly, the “Shithole Countries” statement is sure to resonate with Trump’s base and likely others as well. The very simple answer to why more people don’t immigrate from Norway is that that Norway is a fairer, safer, more stable country than the US and a generally better place to live. It’s on a list that’s growing longer and longer. I’m pretty sure Anders Brevik would be happy to join Trumpland. Not sure many other Norwegians would be interested though. Yeah, it’s already far beyond blue, red and purple states.